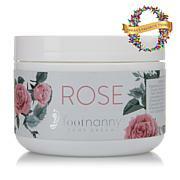 Give your feet the full treatment with this Rose Treatment Set from Footnanny! Soak your feet with the rose and lime soaking salts, and enjoy the softening, cleansing effect that the blend of essential oils and Himalayan, Dead Sea and Epsom salts has on your tired tootsies. After your foot soak, smooth the rose cream over your feet, ankles and legs for a fresh, floral moisturizing experience that is sure to have you day-dreaming of fields of flowers. 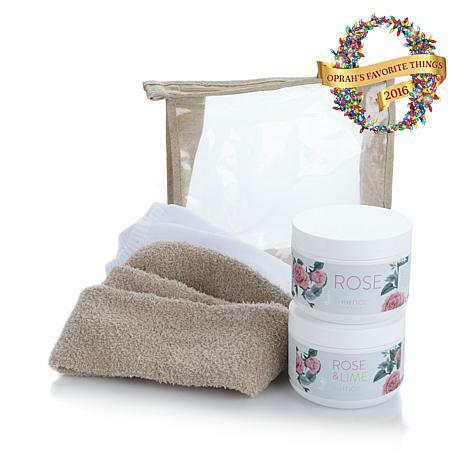 Slip on one of the two pairs of Footnanny socks included in this kit for a cozy finish to your luxurious, at-home spa experience. So go ahead ... treat yourself! Do not use if pregnant or under a doctor's care. Ingredients: Epsom Salt (Magnesium Sulfate), Himalayan Pink salt, Foaming foot salt (Natural Sea Salt), English Country Rose Essential Oil, Lime Essential Oil, Vitamin 12, Vitamin C, Vitamin K, Vitamin A. Ingredients: Deionized Water, Carthamus Tinctorius (Safflower) Seed Oil, Theobroma Cacao (Cocoa) Seed Butter, Soy bean oil,Glycerin, Butylene Glycol, Stearic Acid, Glyceryl Stearate, PEG-100 Stearate, Butyrospermum Parkii (Shea Butter), Cetyl Alcohol, Dimethicone, Allantoin, Panthenol (Pro-Vitamin B5), Aloe Barbadensis (Aloe Vera) Leaf Juice, Calendula Officinalis Flower Extract, Chamomilla Recutita (Chamomile) Flower Extract, Cucumis Sativus (Cucumber) Fruit Extract, Lavendula Angustifolia (Lavender) Extract, DL Alpha Tocopheryl Acetate (Vitamin E Acetate), Retinyl Palmitate (Vitamin A Palmitate), Tetrahexyldecyl Ascorbate (Vitamin C), Carbomer, Triethanolamine, Phenoxyethanol, Caprylyl Glycol, Ethylhexylglycerin, Hexylene Glycol, English Country Rose Essential Oil. All of the Footnanny creams are thick, beautifully scented and luxurious, and leave your skin soft and smooth. This set is such a bargain! You not only get the rose fragrance cream, one of my favorites, but also a jar of foot salts that includes Himalayan and Dead Sea salts. They draw the toxins from your feet, and make them feel better. And the socks are thick and warm. At this price, I bought a set for myself and one for a friend, and she was as pleased as I was. Footnanny is just the best! Not worth the price . I finally purchase . I see no difference in the Product verses a 5 buck drug store brand . The socks are basically dollar store material except for the white pair thickness . I could barely smell any scent and the cream is too thin once applied .